7 1/2, 4A width, 6A heel. Only worn twice. bcbgirls pumps Brown . Shipped with USPS Priority Mail. Slight crease from normal wear. women high heels. Condition is New with box. Shipped with USPS Priority Mail (1 to 3 business days). Size 7 1/2. Has original Stickers inside shoe on insoles. 2" Heel Height. Colors: Bronze. Leather Uppers. Material: Suede. Style: Pump. Length: 9.5". Heel Height: 3". 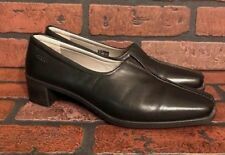 STUART WEITZMAN SZ 7 1/2 AA BROWN LEATHER SLIP ON WOMEN PUMPS SHOES BR6-03. Condition is Pre-owned. Shipped with USPS Priority Mail. Synthetic Casual Dress Pump. The pictures shown above are the exact pair you will be receiving. US Size: 7.5A. Color: Dark Blue. Material: Leather. Size: US 7.5. Super neat Stuart Weitzman pumps with kitten heel, square toe , bow. Beige and gold. Size 7.5 extra narrow. Excellent condition! Size 7.5 SS. Heel Height Approx. Very Good Condition. Size: US 7.5 AA. Color: Navy Blue. Condition: These shoes are in good condition with little wear. Light scuff on right heel. See photos for described condition. Shoes is size 7.5 SS or super slim. New without box. Has very soft insoles. Gianvito Rossi Black Velvet Embroidered Booties 37.5 NIB. I am sad to have to sell these, but they are very narrow and I could not make them work. These stunning booties would be perfect for any one who has high arches and narrow feet. Retail was over $1,100. Perfect for festival season, or any time you need a bit of rock n roll glam. From a smoke-free, pet-free home. Thank you for considering my listing! Bottom soles are a little dirty and show signs of light wear. Insoles and inner lining are clean and show light wear from use. Shoes are clean and in great condition overall. Shoes are in pre-owned condition and show signs of light wear. All shoes are checked for defects and any scratches or dents in the shoe will be listed. Size: 7.5S (extra narrow width). Item is sold as is. Size 7.5, A4. EXCELLENT, pre-owned condition! I have a cat, 2 young kids, rings, I cook, eat spaghetti sauce, snack in my car, vacuum, tend to my flowers, etc. just like everyone else and know things can happen to clothes. This shoe is part of the comfort collection. Crafted of the finest lux calf, nappa and softique leathers, the collection is designed with specially developed, state of the art features like our three piece extra-flex insoles, dual density polyfoam heel pads for greater shock absorbancy and remarkably flexible, lightweight soles. Pre-owned shoe with light wear, still in good condition. Material of shoe is in good shape with light scuff on inner right heel. Bottoms have great tread with light dirt. Insoles have lint/hair. Width:3.25". Foot-so-Port Supreme Brown Leather Size 7.5 aa narrow Moc Toe 3/4" Heel at the back Sturdy Heel Like new Foot-so-Port still holds several patents for redesigned arch support for comfort Fast Shipping. I can usually ship the day I receive payment, as long as I receive payment before 2:00 pm Central Standard Time otherwise I will ship them the next business day. Leather upper and leather sole. Snakeskin accents. Rounded tow with low leather wrapped heel. "All Seasons Casual". Size 71/2 A. New In Box. Size 7 1/2 2A. ITEM(S) EXACTLY AS SHOWN IN THE PICTURES. In beautiful shape. 7.5 AA narrow. Size 71/2 AAA. Near new condition with box. Perfectly maintained heels with no wear. Leather is in excellent condition. 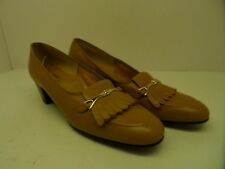 Talbots butter yellow Mules Size 7.5 AA NARROW WIDTH. No woman closet is complete without one. we will fix the issue within 24 hours.